You may remember Enormous from way back in the summer of 2012 as a one-shot at Image Comics. 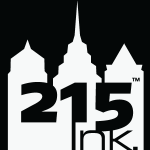 Now, writer Tim Daniel and artist Mehdi Cheggour bring Enormous to 215 Ink as a bigger and badder ongoing series. The first issue is an action-packed and over-sized 48 pages, giving readers a good chunk of story to start out and giving a lot of content for $4. In the midst of a planetary crisis of food and fuel, a vast ecological cataclysm has spawned “The Enormous”, gigantic beasts more at home during the Jurassic Period than modern times. In this new world, there’s only one rule: hunt or be hunted. A strange parasitic fungus is killing people and causing a huge scare out in the Southwestern US. It even spooks the President, who soon must deal with even bigger problems. One year later, Ellen Grace makes a trip into the city when an attack takes place. Jet fighters are flying overhead, explosions are going off in the distance, and there is chaos everywhere. Ellen quickly dashes deeper into the city to get her mother to safety, but it’s anything but safe. The first of the Enormous seem to show up, a large crocodilian-esque creature that wreaks havoc throughout the city, destroying buildings, eating people, and taking down more than one aircraft. Ellen is left in the aftermath, witnessing firsthand what the Enormous are capable of. Tim Daniel quickly gets the action started in this issue. After leading in with some backstory for the Enormous and how they may have came to be, Daniel gets to what any story involving giants monsters must have: action. In the most heated moments, there are entire pages with no real dialogue, and that’s where Daniel and Cheggour seem to work most in sync, with Cheggour showing just how good he can make the book look. Cheggour’s extremely realistic and cinematic style makes Enormous feel like a movie, with Daniel bringing just the right amount of drama and emotion to the mix. The two work together to make a book that is just as exciting as it is dramatic, all wrapped in amazing art. 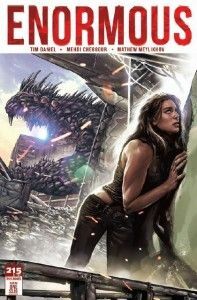 Enormous takes no chances with its second lease on life and comes roaring out of the gate with a stellar first issue. At a huge 48 pages, Daniel and Cheggour give the reader plenty to chew on and pour over. The team makes a strong issue, with something for most every reader. Honestly, it wouldn’t be a surprise to see Enormous explored a bit more on film, even beyond the previous Machinima short. Parental Concern: Moderate. Blood and violence.